Our December Pack Meeting had the boys making Christmas candy packets for the Wakefield Interfaith Food Pantry. The Pantry and their clients are very appreciative of the boy's work. 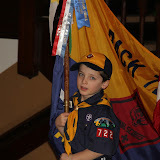 Cub Scouts give goodwill! Also, Cub Scouts that sell popcorn get to give their leaders and parents a pie in the face. Check out the photos!